I leave Tuesday morning, flying from San Francisco to Atlanta, and then on to Buenos Aires -- about 18 hours, airport to airport. I have started the "pre-packing -- deciding which suitcase and carryon to use, and assembling a variety of odds and ends, like chargers and adapters for camera batteries and cycle computer; a new "Pedco Ultra Clamp" that lets me attach a camera to the bike's handle bars or other support, various "lotions and potions," etc. 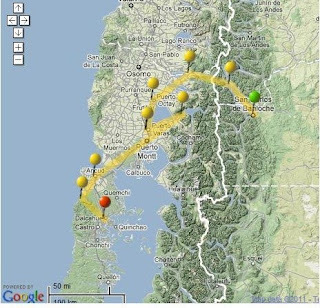 After two days in Buenos Aires, I fly about 800 miles further southwest to San Carlos de Bariloche where we will start cycling. I have been studying Spanish (with Rosetta Stone) for eight months, and will put it to the test on the airplane, reading "Fidel y Raul, Mis Hermanos" a memoir by their sister Juanita. Fortunately, I have a good English Spanish dictionary app on my iPhone. I expect to put it to good use. Although I hope I don't need it, I will be bringing rain gear. There was one day in New Zealand when I really wished that I had it. I even went out a couple of weeks ago and rode in the rain for an hour just to be sure that I could stay dry from head to toe.